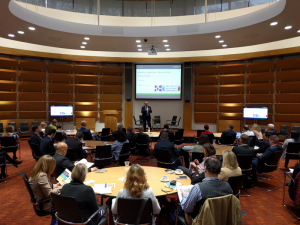 This month, Aylesbury Vale District Council (AVDC) welcomed a host of delegates and speakers from across the UK to its Transforming Culture Conference. The aim of the conference was to tackle the complexities of culture change head-on. The conference followed AVDC’s own, successful programme of change which has now been running for two years. The council has maintained a firm vision of becoming an efficient, commercial organisation and has built a strong, income-driven foundation to support their frontline services. The conference successfully enabled AVDC to share its experiences with other councils and facilitate best-practice discussions amongst peers and industry experts. The Chair of SFEDI Group, Ruth Lowbridge MBE, and Lisa Soderman, Business Development Manager at the Dolphin Centre in Darlington, conducted a workshop sharing their experiences of launching the first IOEE Enterprise Academy within the local government sector through the creation and delivery of the Dolphin Centre’s ‘One Outstanding Team’ Programme. One Outstanding Team not only embodies the values and vision of The Dolphin Centre‘s approach to staff development, it is creating opportunities for intrapreneurship to shine, and for employees’ to be recognised through IOEE accredited qualifications. “It was a privilege to be invited to share the Dolphin Centre and IOEE’s experience of launching the first enterprising academy in local authority with a group of public sector professionals with a hunger to secure the future of public service. “For so long we have talked about embracing change and it’s fantastic to hear the public sector, for which I am passionate about, proactively changing our language to driving change for the better and for a bright future.